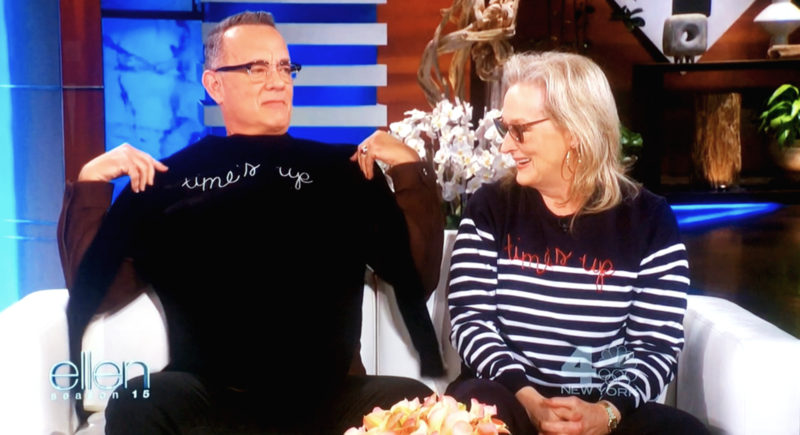 Meryl Streep Chatted Bout Us On Ellen Today! Yeah. We're pretty psyched. What can I say? I love what we do here. I love you all that have supported us from day one, and I love everyone that is finding out about our brand and our mission. Check out the video from today's show here. And then, go purchase your own "TIME'S UP" sweaters from the button below - $100 will go to the Times Up Now legal defense team. Still wondering about that "Poverty is sexist" sweater of ours that Connie Britton wore to the Globes? Check out the video she posted today to have her walk you through it's meaning! p.s. You guys really are the best. Thank you for your support, on instagram and beyond (p.p.s. I'm personally manning the IG account so say hello sometime!). We are trying our best over here, and definitely not perfect and your support is what keeps us going!